Those in search of clean water would typically spend several hours searching for a water source. Now this takes 15 minutes or less. Village residents use clean water to adopt and practice proper hygiene practices. Illness and disease is prevented or reduced. Residents form a water committee which provides leadership and management experience. Spending less time searching for water provides more time to benefit from water. Residents can now focus on farming and selling their goods at local markets. Children no longer take long journeys searching for water. Instead, they spend more time in school which relates to higher education success rates and increased opportunities for success. Other villages see the positive effect of having a clean water well. They begin the process to request their own water source. The cycle starts over. Since the inception of CharityWater.org, 100% of public donations to Charity Water directly fund water projects around the globe. This is quite impressive considering many of our most popular non-profits spend upwards of 30% to cover salaries and administrative costs. So how does Charity Water stay afloat if they take 100% of your donation and directly apply it to new or existing water projects? The answer is simple. Charity Water relies on a network of private donors, foundations, and sponsors to cover their operating expenses. Everything from employee salaries, office space, and company equipment is taken care of, allowing Charity Water to focus on how they can best utilize public donations to support clean quality drinking water projects. Simply donate via credit card or PayPal. Sponsor a water project and change hundreds of lives. A community water project can be funded for as little as $5000. Donate $40 or more and receive a package of Charity Water goodies which can then be donated as a gift. Charity Water is brilliant. They took the colors yellow and black, added a water jug image, and formed a simple yet effective brand presence. This brand has been incorporated into their marketing and product offerings. 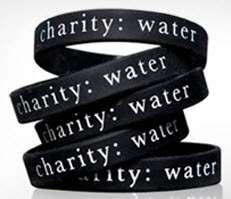 From the CharityWater.org online store, you can buy everything from hats, Saks Fifth Avenue t-shirts, wristbands, ties, cuff links, playing cards… you get the picture; all items are beautifully crafted to incorporate the Charity Water insignia. Check out the CharityWater.org website and please leave a comment below with your thoughts. Feel free to list any other non-profits that are supporting a great cause while adding a fresh spin to the way we contribute and get involved.